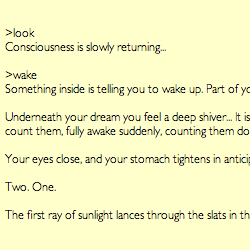 All Roads provides an unconventional interactive fiction experience. While some conventional problem-solving is required, and there are simulated spaces to command a character through, the reader's perspective shifts between characters in an unusual and unexplained way. Part of the puzzle to be solved lies in understanding how and why these shifts are taking place and what system lies behind their inevitable progression. Mac: Download and install Spatterlight if you do not already have a z-machine interpreter. Download and unzip allroads.zip and open the resulting file allroads.z5 in your interpreter. Windows: Download and install Gargoyle if you do not already have a z-machine interpreter. Download and unzip allroads.zip and open the resulting file allroads.z5 in your interpreter. Author description:Venice. The tight winding alleys and long dirty canals. Easy to become lost here, where every street emerges somewhere unexpected. In the central square a scaffold has been erected for your neck, and if only you can escape for long enough you might survive, but in this city all roads lead back to Piazza San Marco and the Hanging Clock. Instructions: Type commands at the ">" prompt and press enter to control the character and advance the storyline. Commands take the form of simple imperatives like "take lamp," "open door," "examine footprints," "wear blindfold." Typing a principal directions, for instance, "north," "east," or "south," moves the character. Typing "inventory" or just "i" will list the objects your character is carrying, while typing "look" or "l" will provide a description of the current location. Non-player characters may be spoken to by typing "talk to" followed by the name of the person. Typing "save" will save current progress to a file, which can later be loaded by typing "restore." Type "help" for additional help. Previous publication: All Roads was published by Ingold and made available on the IF Archive, http://www.ifarchive.org, in September 2001. All Roads is also available at Ingold's site, http://www.ingold.fsnet.co.uk. Ingold's work (the file allroads.z5) is available under the Creative Commons Attribution-NonCommercial-NoDerivs 2.5 License. The Mac OS X Spatterlight interpreter is available under the GNU Public License. According to the readme file the Windows Gargoyle interpreter "is free software, and uses many components by various authors. The components are covered by their respective copyrights and licenses."